Since 1931 Panasonic has been a leading manufacturer of battery technology. In 2005, eneloop was launched as a new type of rechargeable battery that would change the way people live, work and play. This rechargeable battery was created with a very simple idea in mind; provide a common energy source that can be reused over and over again. This “looping energy” became eneloop. Today, eneloop battery cells are recognized by millions of consumers worldwide as the industry’s premier rechargeable battery. eneloop pro Ni-MH 2550mAh typical /2450mAh minimum (AA)* 950mAh typical / 900mAh minimum (AAA)* Hold up to 85% of their charge after one year of non-use* Can be recharged up to 500 times** Pre-charged at the factory using power generated from solar energy and ready to use right out of the package*** Work in extreme temperatures down to –4°F**** Batteries can be recharged when fully, or partially drained Ni-MH, "Low Self Discharge" rechargeable batteries * Based on IEC 61951-2(7.3.2). ** Battery life based on testing method established by IEC 61951-2(7.5.1.3). Results may vary based on conditions of use. *** As certified by The Green Energy Certification Center **** Storage at 20° (68F) ambient conditions (Discharge: . 2lt, E. V equals 1.0V) (varies according to conditions of use). eneloop batteries need a charger to be recharged. Panasonic Ni-MH battery charger recommended. *1 Digital camera shots in comparison with dry-cell battery. Temperature 25℃/77°F, flash once every three shots/every 20 seconds, LCD on at all times. Results may vary depending on camera and conditions. *2 Operation time is shorter than that at room temperature regardless of appliance used. eneloop pro, High Capacity Ni-MH rechargeable batteries feature added mAh power, making them the perfect choice for DSLR flash units, game controllers and other devices that require additional power. While eneloop pro batteries were designed to provide more power for high drain devices they will also perform well in conventional devices that require AA or AAA cells. eneloop’s unique "Clean Energy Loop" initiative is a reality. All eneloop 2100 cycle and eneloop pro batteries are pre-charged at the factory in Japan using power generated from solar energy. This process is certified twice a year by the Green Energy Certification Center. Improvements to the conductive surface layer of the active (positive) electrode material (made primarily from nickel-metal hydride) produce greater conductivity and durability. 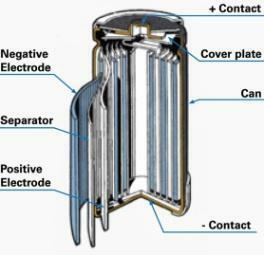 By limiting the degradation of the conductive layer, it has been possible to reduce performance degradation during repeated use and thus increase the number of times that eneloop batteries can be recharged – all without increasing the amount of negative electrode alloy used and enabling the new eneloop cells to be recharged up to 2100 times**.